Decode caller ID information from caller ID modem. Is there a better alternative to CIDTrackerX? Is CIDTrackerX really the best app in Applications category? Will CIDTrackerX work good on macOS 10.13.4? 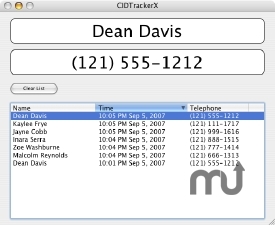 CIDTrackerX can decode the caller ID information from a caller ID modem. It networks with other caller ID programs on Mac or windows using the NCID, YAC or Caller ID Sentry protocols. It has full Growl, AppleScript and Address Book support and can send an email with call details. CIDTrackerX needs a review. Be the first to review this app and get the discussion started! CIDTrackerX needs a rating. Be the first to rate this app and get the discussion started!